The Gallery of Modern Art (GoMA) is Glasgow's main contemporary art gallery, and is second only in the UK to London's Tate Modern Gallery. Fronted by imposing Corinthian columns, the Glasgow Gallery of Modern Arts is easily recognised by the adjacent statue of the Duke of Wellington - the statue is always to be seen wearing a traffic cone as a hat, and has become a well-known glasgow tourist attraction in its own right. 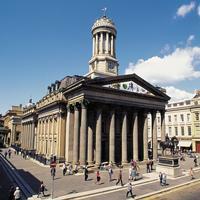 The Gallery displays works from both Glaswegian and International artists. There is a cafe, free internet access and an educational studio with regular workshops. The Gallery of Modern Art is located in the city centre on Queen Street, just minutes walk from Buchanan Street Bus Station, Queen Street Train Station and Glasgow Central Train Station.